Jake Fox went deep twice Tuesday night at Harbor Park to lead the Norfolk Tides past the Scranton Wilkes-Barre Yankees 9-2 in front of 5,688 fans. The Tides slugger crushed a two-run, two-out homer in the first inning off Yankees starter Greg Smith that gave the Tides a 2-0 lead they wouldn’t relinquish. Matt Angle led off the frame with a single to right field and moved to third on consecutive ground outs by Tides hitters before scoring on the blast. Tides starter Chris Tillman (2-2, 3.82) was good enough to make the lead hold up. In his finest outing this season with the Tides, the right hander went a season-high 7.0 innings and allowed just one run on five hits. His lone blemish came with two outs in his final frame when he allowed an RBI single to Doug Bernier. Tyler Henson and Angle delivered consecutive RBI singles in the second inning to double the Tides lead to 4-0. The home team added three more in the sixth inning, starting with Fox’s second home run of the night, a solo shot to leadoff the frame. A single, a hit batter and a walk loaded the bases for Henson, and the Tides right fielder followed with a hot shot to Luis Nunez at second base. Nunez came up throwing to Jesus Montero at the plate, but the catcher couldn’t hold on to the throw, allowing Josh Bell to slide in safely. Angle then drew a bases loaded walk to increase the Tides lead to 7-0. In all, the Tides scored seven times off Smith, who had allowed just one earned run through 14.2 innings this season with Scranton heading into the game. Smith (2-1, 3.05) lasted 6.0 innings and was charged with six earned runs. He walked six batters. 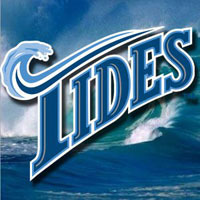 Nick Green added a two-run double off Fernando Hernandez in the seventh inning to close out the scoring for the Tides. Bernier recorded a second RBI with a double in the ninth inning off Jose Diaz that plated Jordan Parraz. The two clubs will continue their four-game series Wednesday with a 7:15 contest. RH Steve Johnson (0-2, 10.90) will take the ball for the Tides opposite RH Lance Pendleton (2-2, 2.61).